Software training firm Infinite Skills Inc. last week introduced its "SolidWorks - Mold Tools Tutorial," an advanced course providing specialized training in the mold tools palette of the popular 3D modeling software for mechanical engineers. Solidworks is a computer aided design program that uses a parametric, feature-based assembly system for building mechanical models. By learning the mold tools palette, users can master SolidWorks’ tools for designing molded parts, including importing, analyzing, and surfacing molded parts. Infinite Skills’ "SolidWorks - Mold Tools Tutorial" offers a comprehensive guide to the mold-design process and prepares students for SolidWorks certification in the mold tool palette. Course author Matt Perez is a certified expert in SolidWorks who has worked in training and private training consulting, helping companies develop training strategies and improve efficiency in the program since 2011. He was recently recognized by SolidWorks for a tutorial on SolidWorks that focused on designing a Chevrolet Camero. He has been using SolidWorks since 2009. Perez begins with an introduction to the commands and toolbars used in creating molds, including an overview of the entire process of designing a molded part, from analysis through design and final editing. The course then covers essential functionality, looking at how to perform critical analysis of your part with draft, undercut, and parting line analysis. From there, the course covers the elements of mold design, explaining how to create a parting line, surfacing functions, and creating the main core and cavity of the molding. The course then closes with a lesson on working with imported surfaces and performing manual edits, before closing with a guide to the mold tools certification exam. "This course is designed to allow users to successfully navigate the mold tools environment," Perez says. "We’ll talk about creating a mold, and we’ll look at each command and work through examples." 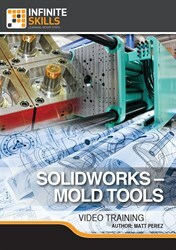 Infinite Skills offers its SolidWorks - Mold Tools Training Video as direct download from the company website at a retail price of $ 24.95. Though the compatibility of programs varies, all Infinite Skills titles and formats are compatible with both Mac and Windows operating systems. Additionally, Infinite Skills tutorials are supported by project files which correspond to examples in the videos. A leader in the field of software training, Infinite Skills designs its courses on a task-oriented model, teaching complex skills by providing hands-on examples and guiding users as they carry out essential functions. Infinite Skills offers a wide range of software titles available as DVDs, digital downloads, and in iPad editions. Infinite Skills now offers a subscription service, providing access to all its training content for a monthly fee, keeping with company's aim of delivering professional training to customers anywhere they want to learn.